Google has been trying and optimizing Android since a long time to make it run better on lower end hardware and they have done a good job with Android 4.4 KitKat. But thanks to the various skins and customisations from manufacturers like Samsung’s TouchWiz, HTC’s Sense, the performance does go down a bit. A bit on high-end smartphones while a lot on the entry level ones. In fact, we’ve noticed even high end Samsung smartphones become sluggish after a time. So, what do we do about it? Well, there are lot of performance speed booster app at the Google Play Store and one of the good ones is DU Speed Booster. 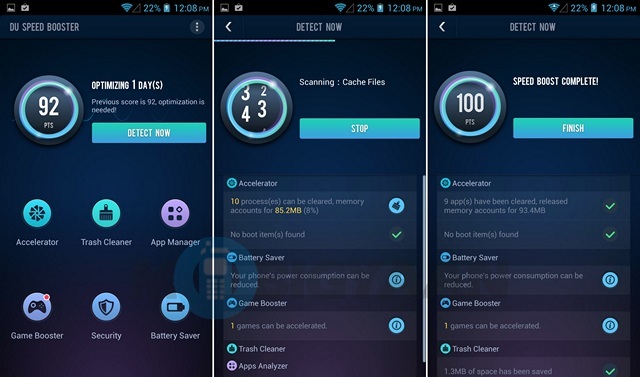 DU Speed Booster is a great performance enhancement app for Android and along with performance improvements, it also brings security features like Antivirus, Call and SMS blocker, Permission manager and more. Moreover, the app is free. The developers behind DU Speed Booster claim that the app has the ability to boost your device’ performance by up to 60%. Well, let’s review the app and see if their claims are indeed true and if this performance booster app is good enough. 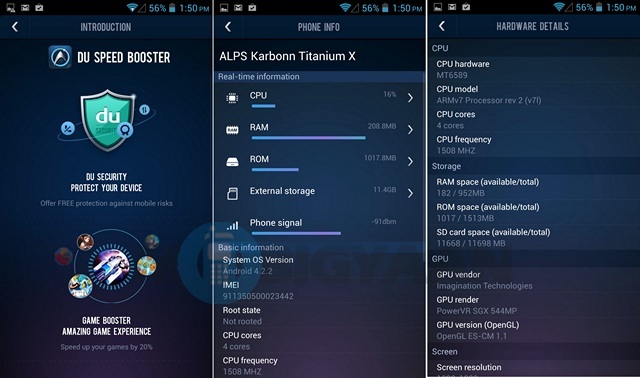 The first time you open up DU Speed Booster, you will be showed the features of the app. 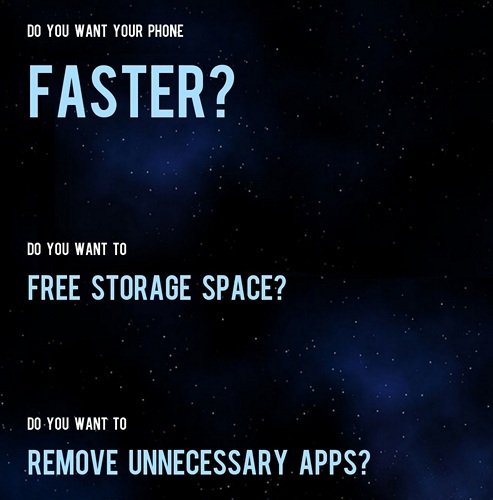 You can make your phone faster, free storage space and remove unnecessary apps. Then, you’ll be asked if you want to join their user experience improvement programs. You can skip it and once you’re done, you’ll be shown your performance points and what things need optimization. You can choose to optimize things individually or you can do it all at once with the optimize button. The main page of the app shows you all the features and the number of days since you’ve optimised your phone. If you want to detect any things that might be slowing down your device, you can choose the “detect now” button. The individual features are presented in a pretty straightforward way. 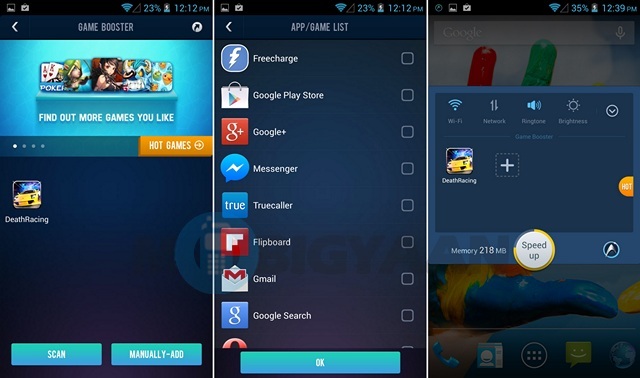 There’s Accelerator, Trash Cleaner, App Manager, Game Booster, Security and Battery Saver. 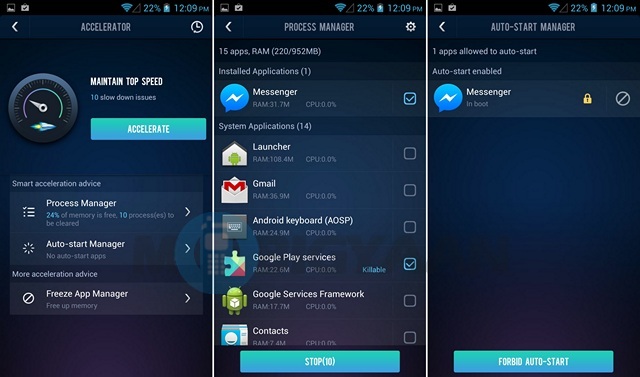 The Accelerator shows you the slow down issues with your phone. You can hit the “Accelerate” button to get things faster. There’s also the Process Manager, which shows you the apps that are running in the background, you can choose to kill apps from there. The Auto-Start manager lets you forbid auto starting of apps. Freeze App manager requires root access though. 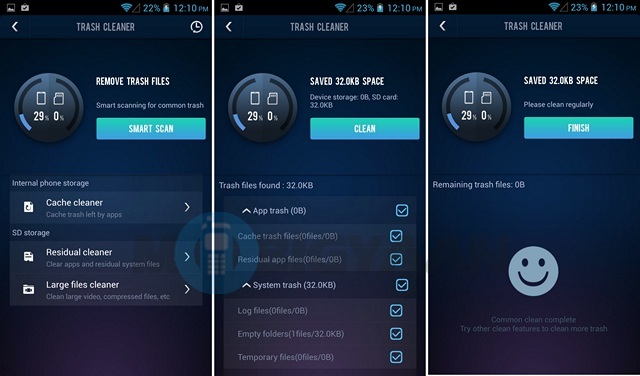 Trash Cleaner, as the name suggests lets you clean up temporary and cache files, which are of no use. You can “Smart Scan” and remove whatever cache files have been saved. 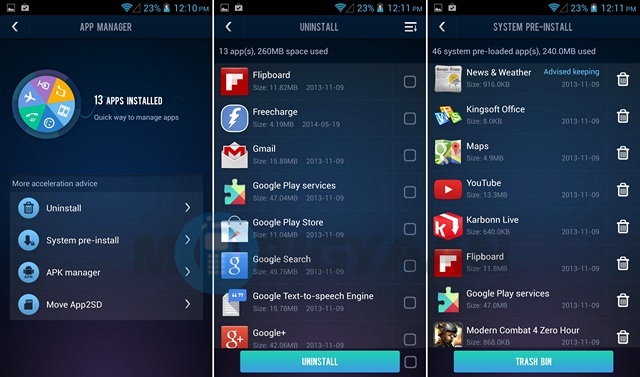 App Manager lets you uninstall apps directly from the app. There’s also the ability to move the system app to a trash bin although this feature failed to work for me. APK manager lets you manage APK files on your storage, it surely is a good way to check all the APK files at one place. You can move apps from the internal storage to an eternal memory card through Move App2SD. As expected, not all the apps are movable. 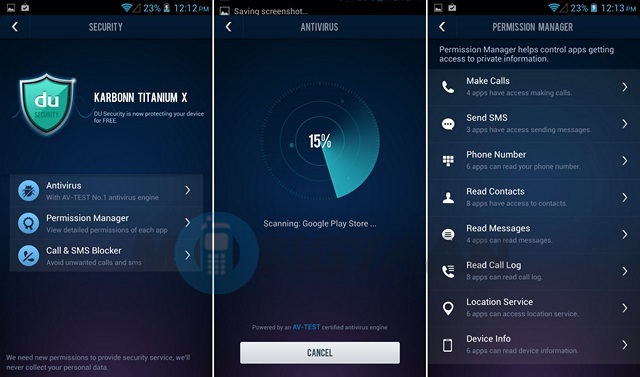 As you would have guessed, Security lists all the security features the app offers. There’s Antivirus to scan for viruses, a Permission Manager, which lets you check the apps and services that can access your information. Call and SMS is self explanatory and lets you block calls and SMS from a number. 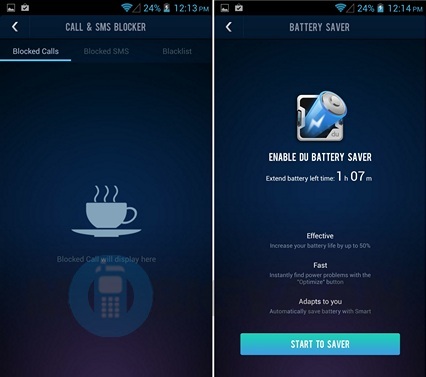 Battery Saver feature needs you to install another app from DU’s stable, the DU Battery Saver and Widgets. On the top left, there’s the menu button, which includes Settings, Feedback, Update, Introduction, Phone Info and About. Settings includes options to create shortcuts for various DU Speed Booster features. Introduction makes you acquainted with the various features of the DU Speed Booster. Phone Info lists all the information around your phone. You can also get the technical hardware details of your device. 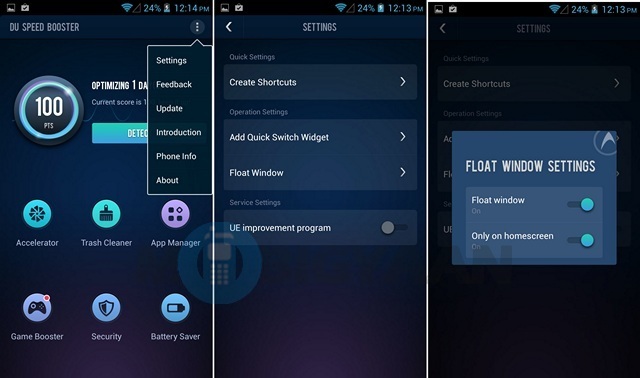 The DU Speed Booster app is surely packed in with a lot of features to optimize the performance of your device. Its security features do add to the overall experience. Coming to the user interface, it’s straightforward and quite simple. The colors used within the app do a seem a tad flashy but it’s alright. The scrolling is a bit laggy at time but other than that, we have no qualms with the interface. As we mentioned already, the Du Speed Booster app is pretty straightforward and easy to use. All the main features are presented on the forefront, so you won’t have to dig anywhere to find any great hidden features.The floating window is great for people who would want boost their gaming performance more often. The shortcuts for individual features is also a great option to boost your device’ speed regularly. All in all, the app is pretty easy to use and anyone won’t have any problems using it. 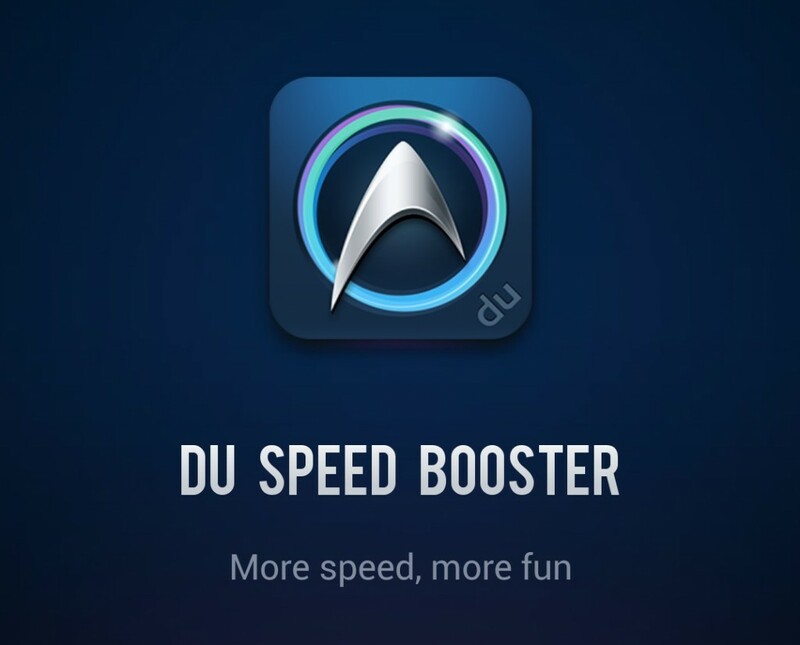 The DU Speed Booster app is a great app if you want to boost your device’s performance. It’s an all in one offering for performance optimizing and security features. The app is free on the Google Play Store, so we’ll suggest you to check out this app if you haven’t already. Hit the Google Play Store link below and get downloading and do tell us, how you like it?